Have you ever heard of water mist systems? Have you ever heard of water mist systems? These water-based fire suppression systems are relatively new to the fire protection industry. High pressure water mist systems use 80-90% less water than your traditional sprinkler system. Water Mist is a new option for facilities that need to protect equipment or buildings without leaving residual water. The size of the droplets delivered by water mist systems may seem insignificant, but this is extremely important. A water mist system mixes water with either oxygen or nitrogen to atomize a droplet of water to less than 1000 microns increasing the reaction surface area for a rapid cooling effect and reducing radiant heat. The atomized droplets will also displace the oxygen suffocating a fire. There are two main types of nozzles. First are automatic nozzles which contain a heating element like a thermometer. When this heating element begins to warm up, it will activate and start the water flow. The second type is a deluge nozzle. The deluge nozzles stay open all the time, and there is no water in the piping. Systems with no water in the piping are great for unconditioned spaces where pipe freezing maybe an issue. The pressure and availability of water may be another consideration. Water mist systems use much less water than a standard sprinkler system and can be custom designed to include water reservoirs, auto-fill systems and other equipment to compensate for the lack of enough water supply and pressure to operate the mist pumps. Another consideration is the type of water you use in the water mist system. Another application for water mist is projects with poor water pressure. 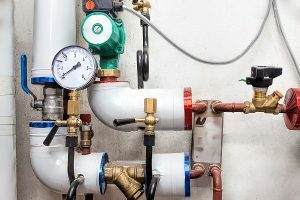 Since water mist uses much less water than a standard sprinkler system, you can rely on the existing water pressure to operate the water mist pumps. LESS WATER! According to Marrioff, a traditional sprinkler system can flow 3600 gallons of water in 30 minutes. Compare that to their system that will only flow 100 gallons of water in the same time frame. Also keep in the mind the water droplet size. Since we are putting out the same fire with much less water, we don’t have to worry about water saturating into materials and the potential for mold afterwards. Did we mention the environmental impact? Less water means less potential for water run-off into our geological systems. Whether you need smoke detectors, fire extinguishers, or an automatic sprinkler system installed at your commercial property, Fireline has you covered. We have been protecting people and properties from fire damage since 1947—and our experience shows in our excellent work! We are known for our wonderful customer service, our expertise, and our reliability. For more information on how we can help your residential or commercial property, visit us online or give us a call at (800) 553-3405. We are located in Baltimore, MD, with a second office in Leesburg, VA. For more fire safety tips, be sure to follow us on Facebook, Twitter, LinkedIn, and Google+. This entry was posted on Friday, January 18th, 2019 at 9:35 am. Both comments and pings are currently closed.